Michele Linn, VP of Content for the Content Marketing Institute, joins the Content Pros Podcast to share her three pillars to a successful content strategy. With the never-ending onslaught of new technology and tools, content marketing can feel like a downhill race that is quickly careening out of control. The struggle is real when it comes to staying on top of the latest gadgets while maintaining a near-constant stream of innovative or captivating material. Michele’s extensive experience in the content marketing field has shown her that sometimes the most valuable thing to do in this industry is to step back instead of forward. Pausing to look around at the field instead of focusing on the next piece of content allows marketers the space to evaluate what they are doing in the context of what their particular market needs. Shifting the content production goal from “filling a void in the marketing calendar” to “filling a need for your customer” creates a strategy that is impactful and scalable for your industry. Sometimes that shift means slowing down so you can pass your competition. What is your true favorite color? I hate to sound boring, but I have a lot of black and gray clothing. I like jeans. I like basic things. I don’t like fashion because it doesn’t interest me. I just have my mix and match pieces that I can wear and not have to worry about it. When you’re not working, what type of content are you consuming? I’m a huge fan of Andy Crestodina at Orbit Media. They have a fantastic blog. I love reading Doug Kessler at Velocity. I follow Ann Handley. Her voice is just so wonderful. I read not only what she writes, but how she says it. The same is true for Doug. I’ve been trying to read a lot more outside of the industry because I think that’s where you get inspired. Randy: Welcome to another episode of Content Pros Podcast. I am Randy Frisch from Uberflip. I've got Tyler Lessard joining me from Vidyard. Just a reminder that we are part of the Convince & Convert network of podcasts. Today we're going to talk to someone whose kind of got some pressure on her over the years. Could you imagine leading content at a company that's called the Content Marketing Institute? You talk about pressure jobs. You talk about all eyeballs on you. Talk about having to show how to do it right, but as marketers, I think that's something we all obsess over is how do we do it right these days? What's the best practices? That's why content marketing has been such a great way to teach marketers how to go to market, how to stay in the loop. Tyler, why don't you introduce the first guest who I know we've gotten a chance to meet over the years? Tyler: Well, not only has Michele Linn had been under the pressure to be a great content marketer at the Content Marketing Institute, but you've done so for a number of years. We've got somebody here today who's been at CMI for over seven years and helping to guide not only their own internal content strategy, but working with many different organizations, helping educate them on content marketing best practices, helping to publish their bimonthly magazine, chief content officer, as well as be a major part of their annual conference, the Content Marketing World. Who better, ladies and gentlemen, to talk to us today about what's new in the world of content and what's old that's maybe new again. Maybe you could just quickly introduce yourself, Michele, and give the audience a bit of background on yourself and what you've been up to the last six, seven years or so? Michele: Yeah, absolutely. Thanks so much for that wonderful introduction, Tyler. As you said, I have worked at Content Marketing Institute since 2010. I was actually the first person who Joe hired back in the day. I've been with CMI since the organization launched. I work with Joe to put together the actual plan to put together the blog schedule and to actually launch the company in April 2010. Since then, I've been working on all aspects of the editorial. Like you mentioned, we have a magazine. We have a daily blog. We have an event, webinars. We have annual research and so forth. I've been in such a wonderful position to be part of this team and part of this broader community all around content marketing for the least seven years. It's been wonderful. Randy: I mean some people may say it's been a short seven years. Some people might say it's felt like it's a really long seven years. I think one of those things in the world of content marketing still being a relatively new discipline within business is that it has changed a lot over that time. Some of the things that you've talked about webinars, blogs, research, those things continue to stand the test of time. I'm curious to kick things off just what did you see over the last decade in this world of how things evolved from a broad content marketing perspective for either yourselves or what kind of trends you were seeing in the markets? What sort of things didn't surprise you and what sort of things maybe have surprised you over the last few years? Michele: I mean I think when we first started doing this, the whole concept of content marketing it was just getting traction. The whole conversation was around why content marketing. 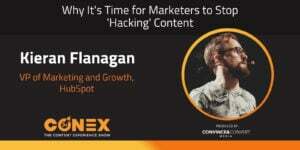 I think over the last seven years the conversation has really shifted into how to do content marketing. Even just from a business perspective, in 2010, we were one of the few companies talking about content on a regular basis. Now obviously there are so many companies who also talk about content marketing, so the space has become really, really noisy and really, really loud. I think as an educator in this space, we've really had to look at how we can best help people. I think the model that works really well in 2010 is definitely going to be shifting because there's so much information out there. I think now people really need more help connecting those dots and help figuring out that path from start through finish. That's something that we've been talking about as an organization to really not just give information, but making sure that we're packaging the information in a way that really helps people work through their process in a logical way. Tyler: It's interesting. Just to jump in there guys, I mean I remember being at Content Marketing World, which is the huge conference you guys have pulled off and in an amazing way in Cleveland year over year. I remember the first number of years when I would go to your point, Michele, it was all about the value of creating content and what it'll do. I feel like that narrative changed a bit maybe not this past year. Maybe it was a year before where Joe kind of said like, "Only do it if you're going to do it well," right? It was like no longer preaching to do content marketing because you have to. It was if you're not going to do it right, don't do it, right? I think that's very aligned as you said just ... Maybe it's the maturity of what we're seeing with content marketing. Michele: Absolutely. I think there are so many people who believe in the value of content marketing and I think that the intent of many businesses is a good one, but I think that the way they're actually executing their content marketing has a lot of issues. I mean either they're still marketing product content and they're saying, "Oh, we have content, so it's content marketing," but it's not really helpful to the business. I see organizations just trying to publish content so they can have "content marketing strategy." Again if it's not audience focused, if it's not different, I feel like in a way there's a lot of opportunity for marketers who can do content marketing well to really succeed in the space even though it is really crowded because there's a lot of companies who are doing it, but they're not necessarily doing it in the right ways. Randy: With that in mind, can you maybe give us a couple of examples at this point and I hate to be negative, but let's go the negative route. The people who have adopted content, but are maybe doing something that's like their downfall at this stage. They overcame that first challenge. They said, "Okay. We're going to create content. 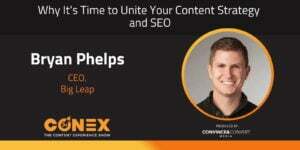 We're going to embrace content marketing." As Content Marketing Institute is out there and you're out there working with clients, what are some of the things ... Maybe give us three that are just huge pitfalls. Michele: I think the one thing that I definitely see the most often is that people are producing content just like everyone else is producing. I think that if you are just adding to the noise, I mean do we really need another how to article that's a really basic overview how to article about whatever happens in your space? If people are not producing content that's really differentiate to their mission or what Joe calls their content tilt, I feel like again people are just adding to the noise instead of actually answering people's questions. I think that's one pitfall. Another pitfall that I really see in the space is I think that people ... As the space grows, people have so much content out there, but the experience that the audience has to find that content is not always a good one. This is something that we're also working to fix. So much of our content is based on what was published the most recently. I think that companies that have a lot of content like CMI can really have an opportunity to package up their content better, so that the experience that a person has once they come to someone's website, they can actually find what they need based on where their current need is, not based on what was the most recently published if that makes sense. I think even though there's a lot of great content out there, people just can't find it. I think that is another pitfall. I think the third pitfall I would talk about is I think it's all around the way that marketers are working. I feel like there is this need for marketers to publish so often and to be on every single social channel and to always be on. I feel like not only is that not a great experience for their users because if you're spread so thin, you can't do any one thing well. I also think that it's tough for the marketers ... It's tough for us too because if we're always on, then we don't have that time and that space and that place to actually create that really meaningful content, which our customers really need. There is this tension to do more and there's this tension to do better, but until you do less, you really can't do better. Randy: There's a lot to think about as I was just going through as you talk about that of the different variables people need to think about in their content strategy to be successful with it, right? You brought up a bunch of things there quickly that I think all have implications. One is the content itself, right? How are you approaching the content to make sure that it's valuable and timely and relevant and all those wonderful things. There's the channels you're using to distribute that content. There might be the technology behind the scenes that you're using to make sure that you're surfacing the right content at the right time to the right individual whether it's the newest piece of content or something that's older. I think there are other sort of pillars that go into a content strategy, which are really making it again more than just what we thought about 10 years ago of creating great content. The opportunity is much richer, but I also think the things we need to think about are a lot different. I think it's a natural evolution for a lot of areas of marketing. On that note, I'm curious how you guys have traditionally thought about what are those pillars to a successful content strategy as you look at those different things and that maybe processes and people and what not, but do you have a simple model that you like to use when you think about one of those different pillars? Randy: Wait a minute, Michele. Aren't we targeting personas, not real humans? Randy: Yes, I say that in jest. Michele: It drives me crazy. You know what I mean? We're targeting you and me and people who have lives and kids and families and other commitments. I agree you're being funny, but it does drive me crazy. We're not these cardboard people out there that, you know what I mean, people can actually target. Yeah, anyway, the more that you can figure out who that real person is to your point, who you can actually help I think is a really good thing. That's the first thing in your strategy. The second thing I always think that the strategy to talk about is how your company can help that audience in a way that nobody else can. I think again this goes back to being differentiated. It goes back to Joe's content tilt. If you want to actually get through all of this noise, get really specific and get really niched and figure out where is that gap in the marketplace and how can you actually serve people in a different way. The third thing I think any content strategy should include is talking about how your content is going to move the business forward. How are you actually going to know that your content is successful? What do those metric look like? For what its worth, I think those metrics change over time. When you're first getting started, you really can't trace your content to sales and revenue and so forth. What does success look like initially and what does success look like as your company moves further down that path. That's a very, very simple ... Look, if I was going to say if your strategy should have three things, those are exactly the three things that it should have. To your point, I also look at the people, the process, and the technology as part of that plan too. I look at those thing in that specific order. A lot of people jump to the technology first, but that's not going to be successful unless you have the people in place and the processes in place to actually figure out which technology you need and then figure out how you can actually use that tech well. Tyler: One of the other things I've always loved about content marketing institute is obviously the frameworks, like the ones that you just gave us, Michele. The other thing that I like because you guys are doing a lot of research and chatting with a lot of customers even just through the consulting that you guys do on a day to day basis. Do you have any stats for us? Are people doing what you're advising? How good is the adoption of a strategy in the first place these days before people even start creating content? Michele: To your point, we have done content marketing research over the last seven years and we're actually publishing our seventh annual survey tomorrow around B2B marketers. I don't have all the specific stats top of mind, but over the last few years, we've been asking marketers how many of them have a documented strategy and around 40% I believe do. Year over year we do see that number change a little bit, but that number is pretty much sticking in that same spot. That's part of the story that we always tell. Before you do anything else, you always need that content marketing strategy. Tyler: That's scary. I mean that's not even a glass half full type of story. 40%. I mean we got to get that positive story higher because that's 60% who essentially don't. Let's take a quick break here on Content Pros Podcast. We're going to dig into some of the strategies that Michele has been working with with companies right after the break as we hear from some of the sponsors that make this podcast possible. 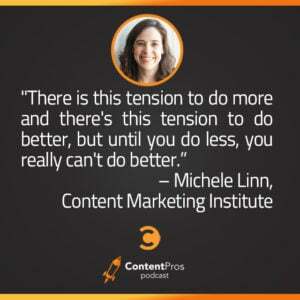 We're back here on Content Pros with Michele Linn with the Content Marketing Institute. Michele, maybe before I finish that sentence, I understand that you are working broadly with a lot of different clients now to understand kind of what their needs are with respect to content marketing and where they can take their programs. I'm curious what you're starting to find in today's market. What are the biggest questions you're hearing and challenges that organizations are facing around content marketing and does it differ by the size of company, maturity of company or things like that? Michele: As I'm talking to clients and actually I'll bring in another data point if you will. We did the last session of Content Marketing World and we also had people share their aha moments that they learned during our event. What I'm hearing from people who go to events like Content Marketing World and what I'm hearing from clients is a lot of people are actually at a very similar spot. As the people just need to step back and figure out what their strategy is, who their audience is, and so forth, I feel like it's one of those things where it's I hate to say people just need the basics, but I feel like a lot of clients I talk to just need those basics because they're doing so much and they want to get it right, but they just need to back up and spend that time putting together the actual plan and the actual strategy. Randy: Tyler, I'm curious at Vidyard. For you guys, who figures out who that audience is? Is that a VP marketing role or is that a content role or is that even a CEO role in terms of who's the audience we want to connect with? How does that actually work at Vidyard? Tyler: Yeah. It's actually evolved over time. We put a lot of focus within our product marketing organizations. We believe the product marketing team is responsible for understanding the market, understanding the products, and understanding the audiences and then connecting those three in ways that make sense. As part of those exercises, they not only define the typical personas that you would look at, but also to develop stories behind some of these audiences and better understand them. That said, at the same time we drive our content marketing leaders to be engaged in the community and to not just sit back like an armchair quarterback and watch the market and write, but to really engage with audiences and on social to join customer calls and things like that so they can get a pulse on what questions people are really asking within our market and they can use that to feed into their strategy. Then our SEO digital team also feeds into it to make sure that we're tracking and understanding what are some of the search terms and keywords that are really fueling conversations out there. We try to make it across discipline activity. Then the content leader really takes all of that and then owns the messaging to the audience. It's very fluid in how it happens, and we try to get a lot of people to contribute to it. Randy: That's really interesting. We're doing similar stuff over at Uberflip where I think we're doing a lot of what you describe, but some of the areas that we're finding the most interest to figure out who the right audience is and granted this requires being in market for a bit, but it's leveraging our sales team and our success team, our post sales team, to figure out who are the customers that we're actually connecting with, what are the challenges that they find. Then kind of going back to the more important thing, how do we evolve content strategy to better nail the right people the next time. Tyler: I think one of the interesting things about that, and we do some more to make sure we are staying involved with what has to happen next. Kind of that back to that point, Michele, one of the things that I feel has happened over the years is a lot of companies got stuck in the "our content strategy is our blog" and our blog are written articles, 500 to 800 words in length, and there's sort of definition around it. Again a few years later they realize they're going through the motions of this content strategy, which is really just three blogs per week at this length and targeting certain keywords. We try to make sure we don't get caught in that trap and infusing different styles of content, infographics and videos. Making sure we're creating content that's relevant to our sales team, as well as to our online strategy and what not. I don't know if you guys are seeing the same things, but I think as we step back and think about the why of our content strategy and then the sort of how and what, it's actually really refreshing to take that perspective and say, "Well, we don't have to do things the way we've been doing them." What really would be the way to connect with people in a more interesting way. Michele: I think that's fabulous you guys are doing that and we're actually in a similar phase with CMI too. For what its worth, I wrote a post. I think it was this summer or this spring and it was called something like your content strategy is not your editorial calendar. It was one of those ranty pieces, but it really resonated with a lot of people. Because like you say, a lot of the people think, "Okay. I'm going to write about this. This is my strategy," but those are topics. That's not strategy. To your point, a lot of these companies who've been doing it a long time and I would put CMI in the same boat, I think it's really worthwhile to step back and figure out where is the market changing and how are things evolving instead of just doing things the way that you've always done them because that's how they've always been done. I feel like with CMI and with a lot of other businesses we really are at this inflection point. I know as a team we've talked about a lot of different things that we're doing. Like for instance, we've talked about it doesn't make sense to be still publishing a blog post every single day. Do people need that much information? Should we be restructuring our team so that we can put effort into other things that are going to help people? We've looked at the way that we measure our success. Like for instance, this summer we put together posts on how different vertical do content marketing. In the past, those types of posts never "do very well" because those audiences are so very niched, but we just decided, "You know what? Even though they might not do well in terms of traffic and/or conversions, these are stories that we really should be telling." We just decided to move forward. We're just trying to look at what the market needs and not always tying everything so closely back to metrics knowing that just because something doesn't do as well as something else, that it's still fine. Because a lot of our pieces that do really, really well are those really basic piece and I think that that's fine, but at the same time I feel like there's a whole segment of this market that really needs beyond basic. We're trying to do different things to hit different audiences or different levels of education. Randy: How do you do that? It's a great question because I mean to the earlier point, seven years of doing this, a lot if people have really excelled and become content marketing experts or as we say on this podcast, a lot of the people are content marketing pros, right? A lot of people are just jumping in for the first time. One of the things that I mentioned that Convince & Convert does is Jay Baer does a great content marketing class available at contentmarketingclass.com for those who are just jumping in, want to understand better, want to raise their game. To be honest, I think content marketing has become such a loaded term, right? On day one seven years ago, I think as you said it was how do I create content? As a result, content marketing became this way that we create content as opposed to as you said, now we have to think about how do people consume that content, how do they distribute that content. How do you think about the maturity of the actual marketing practitioner out there? Michele: That's something that we've been talking a lot about as a team. As we talked about, I mean there's some people who are just getting started and I'm always so surprised and I don't know why it always surprises me, but there are so many people who are just getting started. There is a huge need for that information. I think the way that we really try to help those people best is we really want to connect the dots so there's not all of this disparate information out there, but there's really like here's an actual process to follow. Not to be too pluggy, but we actually have an event that we do each fall. It's a road show and Robert Rose and Joe Pulizzi will go out and they'll actually talk about content marketing from start to finish. Then we turn the content from that event into our curriculum for our CMI University. That's where we suggest people go to if they're starting from start to finish. Then what we've been trying to do, like we have different vehicles to talk to different levels. We have our magazine chief content officer that focuses more on trends. 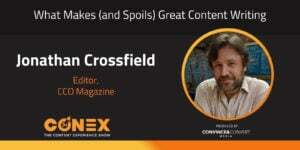 We have an event in the spring called Intelligent Content Conference that really looks at the future of content. We try to have different offerings for different people depending on where they actually are. Our blog has the basic topics all the way through the advance topics. It's definitely not something I don't think that we have figured out yet, but it's something that we are actively trying to work on because as the audience has shifted over these past seven years, you still have those people in the beginning, but we have those people who are at the end. We have to try to help as many people as we possibly can. Tyler: Let me ask the burning question on my side, which is those who are pretty mature with their content strategy or they're looking to kind of reinvent themselves and kind of leapfrog the competition a little bit and to kind of embrace what's new, are there any things you're seeing as really critical parts of the next frontier of content marketing? Are there media types? Are there styles of content? Are there different approaches that you're expecting are going to be the real buzz over the next few years as ways for people to really take their content strategy to the next level? Michele: I think the companies that are going to do really well are those companies that have a really solid process in place so that they can scale. It's those companies that once they have a really solid strategy and they have the people and they have the process, those companies that can really start to use technology in a way that makes a lot of sense because technology can enable so many things from AI to personalization. There's so many things that technology can do, but I don't think most companies are there yet to actually use it really, really well. I think there's a huge opportunity for those people who lead the pack to start doing those types of things. Randy: It's an exciting time for sure. We've gotten to know so much about what you've done for work over the last seven years. One of the ways we always love to wrap up this podcast is to get to know the guest a little bit when they're not at work. I'm going to start with a softball for you. You may or may not win people over at work with this answer. Anytime I see you or any of your peers from Content Marketing Institute, you're wearing orange. What is your true favorite color though? Is it orange? Is your cupboard kind of got an orange and then some actual variety? Michele: You know what? I'll be honest, I have my orange stuff that I wear to CMI events because I always want to support. I hate to sound boring, but I have a lot of black, a lot of gray. I like jeans. I like basic things. I don't like getting fashion because it doesn't interest me. I just have my mix and match pieces that I can wear and not have to worry about it. Michele: I'm very, very simple and pragmatic. Randy: I always wonder what certain brand ambassadors for their company's cupboards look like. Like Tyler, I imagine yours as like all green. As you would all imagine, mine is all pink. In fact, my kids have like ... Even my boys are more comfortable to wear pink than any other kid in their class. It's kind of fun. Randy: My other question for you is more so like when you're not working, what type of content are you consuming? You can't say Content Marketing Institute's content even though it's awesome and there's enough there to keep us busy every day. What blogs are you going to? What threads are you going to just to keep your own sanity? Michele: I mean there's a lot of different stuff I look at. If you're looking for marketing stuff, I'm a huge fan of Andy Crestodina at Orbit Media. They have a fantastic blog. I love reading Doug Kessler at Velocity. I follow Anne Hanley. Her voice is just so wonderful. I read not only what she writes, but how she says it. The same is true for Doug. Quite honestly, I've been trying to read a lot more outside of the industry because I think that's where you get ... I feel like that's just where you get inspired. Right now I'm really interested in mindfulness and I'm really interested in just turning off and being present. Actually sometimes, it might sound backwards, but I actually try to not consume content and just get really comfortable with quiet just to let my brain reset. It's harder than it seems, but it sounds ... Anyway, I'm almost like going back to basics and trying to turn things off. Randy: No, I think that's a great idea, great practice. I try and do that myself when I get home and I put my kids to bed for that 45 minutes or so. I actually stopped wearing an Apple Watch for that reason, which was I couldn't fully disconnected. There's value in it sometimes. It allows you to clear your mind and focus on other things. Good on you for making that a priority. Anyways, Michele, this has been a ton of fun. On behalf of Tyler at Vidyard and myself, Randy at Uberflip, really appreciate you taking the time to join us on Content Pros. If people have been listening in and enjoying this, we have a whole bunch of other podcasts you can check out at ContentProsPodcast.com. You can find us on iTunes, Stitcher, Google Play, pretty much anywhere you get your podcast, you can find us. Please enjoy and leave us feedback as to what you want to hear more of. Until next time, thank you, Michele Linn for joining us from Content Marketing Institute. This has been the Content Pros Podcast.